Like many of you, I’ve participated in plenty of church planning meetings where we’ve asked ourselves: Where can we get more space for the youth group? How can we better serve our community? What is the best location to store the worship equipment when not in use? It is questions like these that prompted our leaders to rethink how our congregation uses our facility space, especially our multipurpose room. Multipurpose areas can come in different forms, shapes, and sizes in any given church. They may reside in the basement and serve primarily as the cafeteria, serve as a gymnasium that rivals the local high school, or occupy an entryway between the front doors and the worship area. Whatever your multipurpose room’s design, it is time to rethink how you use this valuable square footage. Our church’s strategic planning team began to look at ways to make our multipurpose room flexible to meet the needs of the congregation and started by answering these 5 questions. What ministries need additional space and what their need is? As your congregation changes so will the ministries you offer. A key element to managing the ebbs and flows of your ministries’ needs is to not make any permanent changes to facility space. Our youth ministry wanted to convert a classroom into a “backyard” scene. We spent countless hours and materials converting the room to look like someone’s backyard. After only 3 months, the youth group outgrew the space and the chain link fence had to come down, and the beautiful murals were painted over. We quickly needed to find this growing ministry a new area for worship and small group classrooms. A ministry might think they need more space, but in reality, they may just need to improve their space utilization. You might need to adjust the time allotted to some ministries using this space, relocate their meeting location, or section off the room with room dividers to create additional rooms within the multipurpose room. 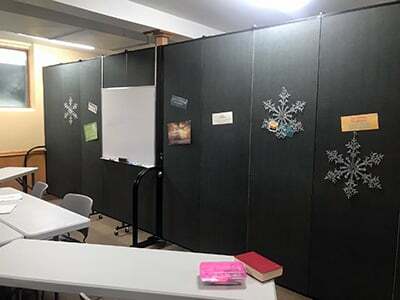 By using room dividers to section off the area, you are able to offer more ministries to your congregation and community. Does our current multipurpose space align with our vision and mission? This is an excellent place for your team to start. By using your church’s mission as a guide, you can identify if your ministries are meeting the goals of the congregation and if these ministries are using your facility space efficiently. Take note of what activities are taking place in this shared room. Ask, do these activities align with what God is calling you to do? When we looked at our multipurpose room activity calendar, we were amazed at all the various users of the space (worshippers, diners, mother’s day out kids who need a wet-weather play space, basketball leaguers, MOPS, etc.). While all these activities are great, we needed to evaluate if they aligned with the church’s mission to serve the congregation and community. After much discussion, some ministries found a new home, some were relocated to other areas in the church, and some shared the multipurpose room simultaneously. Can we create a space flexible in design and serve the ministry needs of the congregation? Yes! However, it is crucial to incorporate a flexible design when repurposing or renovating your multipurpose room to adjust to ministry needs. Let’s take a look at some key elements to consider for your shared space. Flooring- The flooring should not limit the events you want to schedule. An ideal flooring should withstand the use of tables and chairs, the impact of balls and wheels, as well as the use of various footwear pounding the surface. Consider a flooring surface that absorbs sound and is easy to clean. Furniture- Use folding chairs and tables that can be arranged quickly by volunteers. Having this flexibility seating allows you to change the use of the room from a bible study to a volunteer dinner in a moment’s notice. Rolling portable partitions are also a must to maximize the use of the multipurpose room. 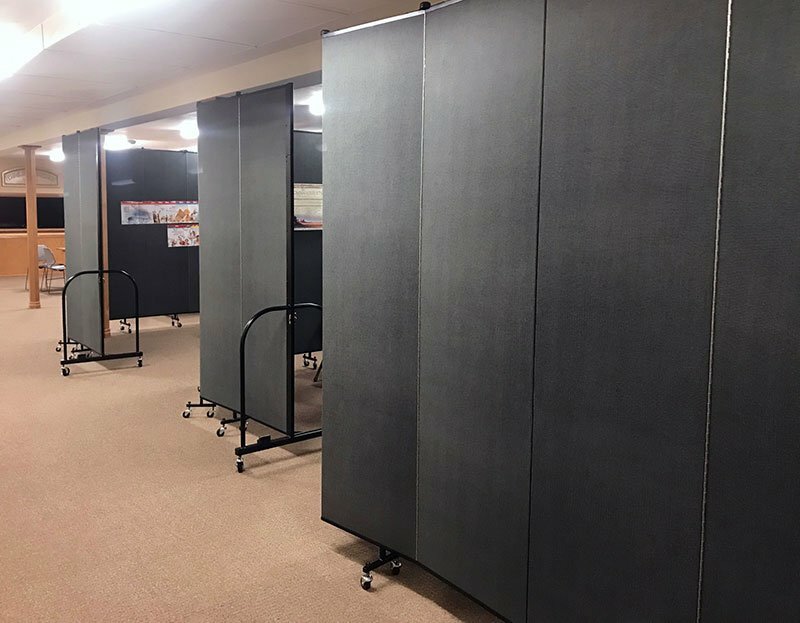 The partitions divide the space into multiple classrooms, limit access to restricted areas, and dampen the sound for a quieter environment. Lighting- Consistent light levels throughout the room are key. Using a dimmer switch allows you to adjust the lighting levels to fit the use of the room. How do we provide enough storage for this shared space? With your multipurpose room serving as a café, lounge, classrooms, a stage area, and a gym, offering enough storage is a must. If the space is going to need to transition quickly with volunteer help, make sure your storage is ample, close, easy, and well thought out. Sections of the storage room can be allocated to various ministry teams. Add tall shelves, attached to the wall for simple organization. Remember that not all storage needs to be behind a locked door. A temporary partition wall can provide the storage space for larger items that are cumbersome to roll in and out of a small door opening. To access the storage space, just fold the room divider up and roll it to the side (typically a 2’x3’ space). What are the best ways to keep the cost down and achieve our goals? With construction costs averaging between $85 to $150 per square foot, construction can be an expense that is not feasible for your church. The price might force you to look for solutions to serve all your ministry needs in the space you currently have. Can a ministry move to another area in the church that is underutilized? How can ministries share their space? Do not let your facilities size, design or unique challenges limit your ministry capabilities. At the conclusion of our multipurpose room and facility space utilization assessment, we realized that to be good stewards of what God has entrusted to us, we needed to be creative in using the current space we have. To us, that meant dividing rooms with room dividers to provide for our current ministries and new ones yet to be organized. It also meant saying no to great community opportunities that didn’t align with our overall church mission.